Uncategories Friday is Quilt Shop Hop Day for us . . .
Friday is Quilt Shop Hop Day for us . . . However I do want to answer some questions I've received about my last post. For those interested the scripture quilt is a Book of Mormon Scripture Quilt pattern by Jane Badner Phone # 801-359-4249. Joyce Week's patterns can be ordered directly from her, Phone # 801-566-9020. 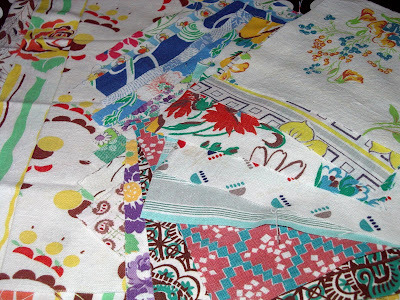 But, the Quilting Cottage in American Fork, Utah does have one pattern of each. Okay before we go a shop hoppin' here are some fun goodies to look at to continue celebrating my month of June fun. 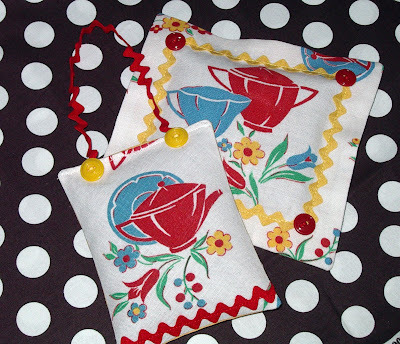 I saw these sachets on Etsy and totally fell in love with them. 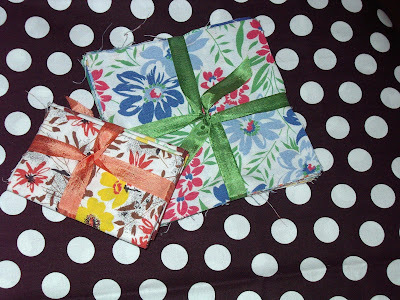 The fabric is feed sack and they are filled with luscious lavender. When I opened the mailbox and reached inside I could already smell the lavender, that is just how fragrant they are. I'm loving lavender right now and I may even make some lavender sachets myself or for gifts. These are so darling and constructed so well. I really like supporting other crafters on Etsy and I always look there first when I want to purchase something. Right now my entire sewing room is filled with the clean fresh smell of lavender. I may just keep them in here! My sister-in-law and their family just returned from vacation in Hawaii. They brought a goodie bag back for our family. It was so thoughtful of them. Obviously the cute pineapple pincushion is mine to add for my lovely pincushion collection. But I stole this candy out of the goodie bag before the rest of the family had a chance to see them. Shhh. There are other treats in there but this one is mine. Thanks Lorraine and Chris. Natalie's boyfriend Justin went to Cape Cod this month for a friend's wedding. 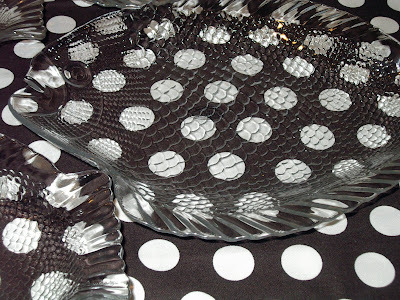 He brought me back some seafood platters to use when we have our displaced easterners seafood parties. I miss the east coast and these are such a fun reminder to have. The plates are cute and whimsical/vintage looking. Its hard to see how charming they are in this picture but wasn't that thoughtful of him?! He's a keeper. Hint hint. Thanks Justin. Sweet Stacy sent Shelbie and me some wonderful gifts. I opened mine but saved Shelbie's for her to open this weekend. 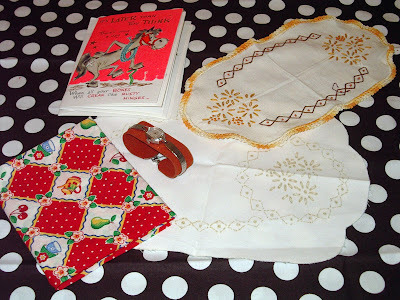 When Stacy blogged about the family general store in a little Utah town closing, I was so jealous of the stash of fun things her mom sent her. So Stacy shared some things with me! Isn't that great. She's a great girl and I'm always envious of how perfect her Dear Jane blocks are. I love vintage cards. The embroidery cloths are so fun. I love them and of course the ME fabric is so 'me'. The watch reminds me of my mom. She wore one almost identical in the 70s. Every time I look at that watch I see it on my mom's wrist in my mind's eye. Thank you Stacy. I've been enjoying Glenna's online store and stash for years now. She is one reason I caught feed sack fever. 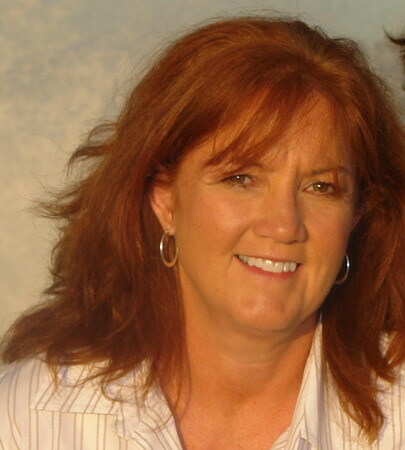 When she started her blog I was so glad to welcome her to blogland. Recently I bought 3 feed sack pieces at her Etsy store. And she sent me a thank-you gift along with the squares for helping her get her blog name out there - some feed sack charm squares! Of course I love them and I'm adding them to my feed sack stash that I use very carefully. Thanks Glenna. I showed you my friend Ashley's 1st quilt earlier in the month. Well here is her 2nd quilt. I'm so proud of her. 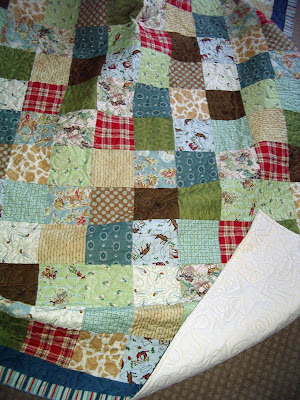 It was too big for me to quilt on my Bernina so she found a machine quilter and had it quilted in cowboy stars and rope. Its hard to see the quilting in these shots. I love her fabric and she did a really super job. She's been making some cute outfits for her baby, too. Its great to see young women create for their family. I machine stitched the binding on for her and now she will hand stitch the binding to finish the quilt. The machine quilter that Ashley used has all her customers purchase transporting bags. They are bright colors and clearly are NOT trash bags (most of you know my sad quilt/trash bag story). I think this is just such a fabulous idea. 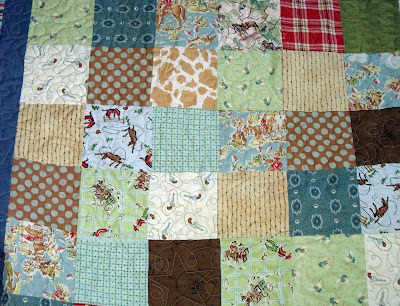 There is a pocket to show who owns the quilt and a pocket you can put instructions for quilting into. It has nice big straps to carry it to and from the machine quilter. And the bag keeps it clean and easily identifiable. Isn't that so smart? I've got to get me some of these bags. I never want to use a trash bag for my quilts again. So tomorrow morning bright and early Shelbie and I are headed out to hit maybe 4-5 Shop Hop stores. Its going to be a scorcher too and I'm sure the shops will be busy busy. I'm taking my camera and hopefully I'll have fun things to show for next week. So stay tuned. that was so sweet of justin...=)...don't you just love nice guys?...and all of your other pics? eye candy!!! =) thanks for posting them! Those sachets are absolutely darling!! Lavender's one of my favorites,too.For some reason when I was going thru some health probs & about could've rolled in the stuff,I kept adding more & more plants that year,it's probably equivalent to how cats feel about catnip! Great pincushion,yummy treats & wonderful family & friends! !You are a woman who is richly blessed!!! It was definitely a scorcher the past two days and we are so so so tired we're not going to make it out tomorrow, we decided to stay home and start sewing on our newly acquired projects. We did 21 shops in two days. Of the 21 only 9 were in the SHOP HOP the rest were part of the Scenic Byway. I will post todays pictures tomorrow. You can see yesterdays pictures today! If you go to Red Rooster take pictures. I heard the quilt is darling! Maybe Rae Ann and I will try to go on Saturday. It was fun seeing you and but I was sad I missed talking to you. Have fun with your daughter! Wow Nanette! That was a whole lotta postin' you did in the last 24 hours! Super cool seeing all those fabulous quilts! And you're so lucky to have that group of ladies. I'm happy for you. :-) Thanks for sharing it all with us! 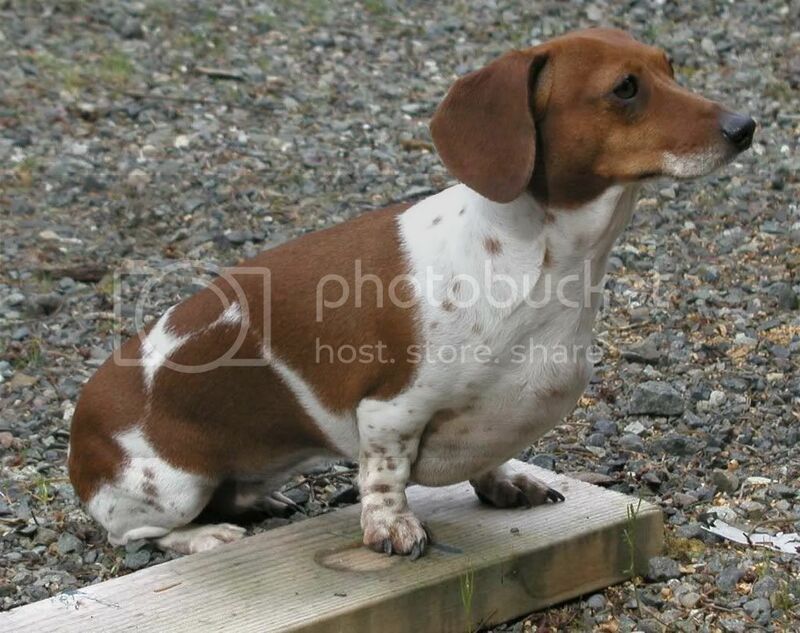 What a great post with so much to take in!! And I am a major feedsack junkie...I know where I am going to go visit. A lot of nice treats for you there! Have fun on your shop hop! 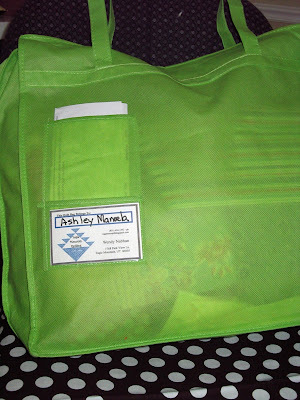 Love the bright green quilt tote bag idea. 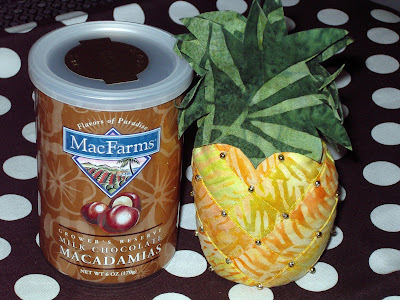 My mouth is watering for Chocolate Covered Macadamia Nuts (I lived in Hawaii for 3 years). Mmmm! M.... I can just smell those little sachets too. And they are SO PRETTY! Ok.. so lets grow Lanvendar!! thanks for the fun pics. i look forward to seeing more pics from shop hop. Ashley's second quilt is so cute! HAVE SO MUCH FUN shop hopping today! I SO WISH I could have made my trip to Utah this week instead of last! Although, it probably wouldn't have been a good idea, since I was only allowed one check in bag. I would have had to ship stuff home! LOL. Have fun shop hopping! Thank you for the info on purchasing Joyce's patterns. I love the sachets, but they are all sold out now. I'm hoping she'll create more. I also love the pineapple pincushion - too cute! Thank you for posting all these wonderful places to visit, too! I wish you were going out on Saturday! That's when I'll be there! Can't wait! I hope you had a great shop hop. Thanks for the info on the BoM quilt! I look forward to seeing your pics of the Shop Hop! I was actually able to get to a few today while I was exchanging blinds at Target. (Any excuse to get to Utah this week!) I hope to show my goodies soon on my own blog. Thanks for yet another boost by mentioning me! I am so jealous that you have so many cute quilt shops close by. What a treasure!